My uncle used to be the Sheriff in the town where Katie is standing, up there above all these words, and my cousin, his son, was killed in a head-on collision in his early 20s. My family is a big family and my uncle was an ex-Texas Ranger, so the funeral was standing room only, so many people there as a show of respect, so many from every branch of law enforcement you can name except Secret Service, and I wouldn't count them out. I remember at one point standing outside the church with other cousins, one of whom said there was more firepower at this funeral than usual, if you combined all the law enforcement weapons with all the kinfolk packing heat. I remember laughing a lot at that. All these great old places that are almost gone, this one once a movie theater, now crumbling down, no back wall, the inside full of graffiti, but really great graffiti; I took tons of pictures. Another weekend and Katie & I were out driving again; we laughed about a facebook comment, a woman writing how rare open-minded Texans were, and we sang back to her a very politically incorrect Ray Wylie Hubbard song, not serious, but not really joking either, it growing tiresome and boring to hear the silly oh-so-predictable stereotypes, but, like I said, we just sang the song back and laughed and did that Texas shopping thang, and I almost bought a white petticoat that no way would even fit into the jeep it was yes-that-huge (we Texans may exaggerate a bit) and I found the perfect, perfect table for my in-the-future art studio, 8 feet long, white, 500 bucks and I'm so broke, so no can do, and really nowhere to put it right now. I didn't care, it was that perfect, but it was also that left behind. The map at the taco place caught my eye - the perfect shade of light teal and I should've taken a picture, but it's Texas and we drive, so I'll go back and catch it another time. And I'll take more pictures of the Texan - it's a shame to let it go. Think of all the first kisses that took place there, all those young hearts-a-fluttering, all that energy still hovering about. If I had money I'd restore it to something, if not a theater. On the way home, Katie and I passed a funeral procession headed in the other direction, and of course, everyone pulled over to the side of the road, even on our wrong side, and waited until it had passed, and I talked about when my father died, and how touching it was to see that show of respect from the drivers on the road. It's a small gesture, but a very visible one, and it meant a lot. We were glad to carry on the tradition, glad to live somewhere that still does such things. truth: i have never wanted to visit texas. but baby, your words and your ways and your love of state make me want to brave the blinding heat and come on down to visit you all. oops. make that y'all. and p.s. thank you, bluebird. Mmmmmmmm!! There was a theatre, The Broadway, right in the middle of the part of town I grew up in, where my mom would drop me off once a year, when Gone With The Wind would come, at 9 a.m. & pick me up at 9 p.m., after I watched it 3 times in a row. Every year from when I was about 8 until I was about 17 when The Broadway closed. It's now a business building now; a friend of mine offices there. In my heart, though, it's all greasy popcorn & sour pickles & Dr. Pepper & that magical music that opens & closes the film!! how sad about your cousin... so very young. Truth: I once lived in Texas but never considered myself a Texan, though my daughter grew up saying "mirra" instead of mirror like Pacific Northwesterners do. Oops, forgot to tell you that I'm going to borrow the "if I were a. . " post you did a while ago. But man oh man, it's taking forever to find pictures to go along with the words. Meri - We once had an employee from Uruguay whose daughter was/is a Texan through & through. I used to just laugh because I always expected a Uruguayan accent from her, just like her mom, but she was a slooowww talkin' Texan, and it just cracked me up. She looked like Sophia Loren and when that Texas drawl began, it was the funniest! And I can't wait to read your "If I were . . . " post. It's the best meme I've ever come across. one of these days.....i'm coming to texas ! can you believe i have never been ? and my daughter's god father lives there ? somebody needs to take those letters off that building as they are too cool.....you could do that you know if you wanted them ! call the city ! The great old places, yes, it is so sad to watch them crumble, but you and your pictures, you can keep them alive, a little. We need more traditions like that, more things to keep us whole, as a community. More things to make us stop and notice how precious life is. You truly make Texas sound enchanting. I had never thought of it that way. A yellow rose, a blue flower, letters the size of the sky. A heart like the wind. ya'll took a road trip for sure ....been through many a small town with that same feel..ok when your commenters arrive i must come down the road a piece to your place too...a big time will be had by all!! Ms. Emma Tree, glad to see your post. 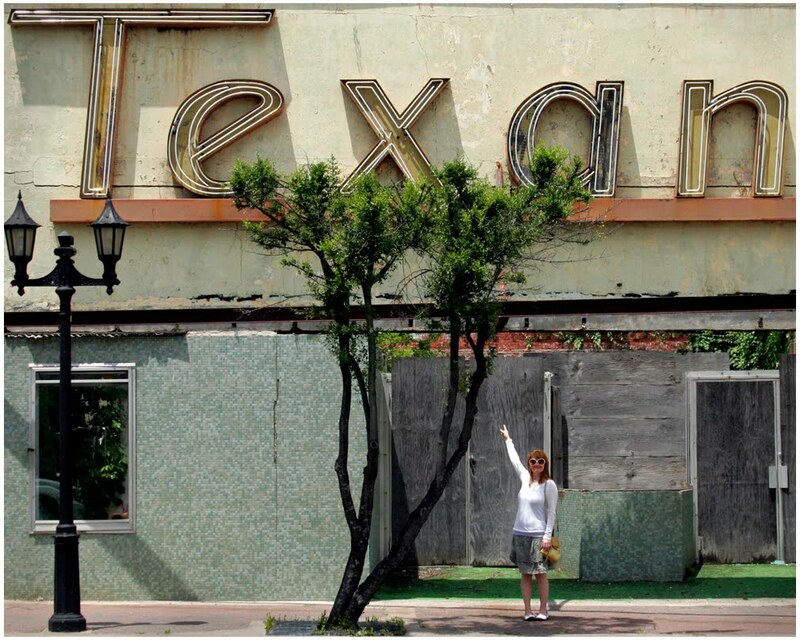 I have not been by for awhile,, for that i apologize but it is I that have missed out.. Where is that "Texan" theater? I have been taking pics of old theaters whenever i travel to a new town. my blog last week was about the "Campus" in Denton. I am captivated by old theaters or any old building.. I enjoy your posts but wonder about this one. Debi, this is simply beautiful, and it makes my heart so happy it hurts. Good grief, I love Texas and miss it so badly. I was not lucky enough to grow up in a small town, and until I moved to the Inland Northwest I didn't see much in the way of urban decay. But here in Spokane there are many abandoned buildings, and I have come to cherish the stories they tell and love them in their crumbling elegance, just as I have loved the burn out shell of a house that sat in an abandoned lot beside a gas station in Austin for most of my life, slowly sagging into the ivy and cactus. The map at the taco place....only you can find this kind of beauty in the most unlikely places. You entice me to look deeper at things. Oh, the part about the funeral procession. I have often thought of how sad it makes me that in most places people don't even pull over for ambulances, much less funerals. I love Texas for many reasons, but men tipping their cowboy hats to me and people pulling over for a funeral procession are two of my big ones.